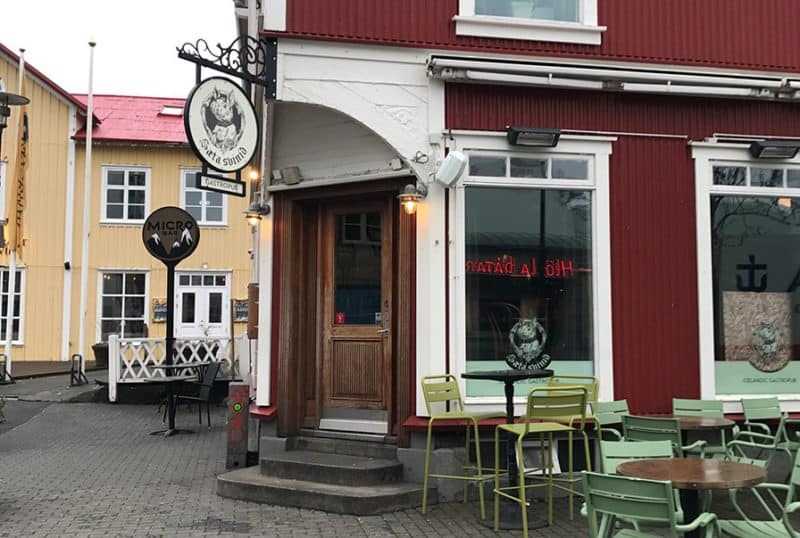 Situated on the edge of the Ingólfur Square in Reykjavik, Sæta Svínið Gastropub is a wonderful place to stop for a beer and a bite. We first dropped into the Sæta Svínið Gastropub (Sweet Pig) to grab lunch on our first day in Reykjavik. The convenient location puts it close to the shops and bars along the strip. Micro Bar is located right behind it and is a must-visit spot for every craft beer fan. Warm wood fills the room, with small tables throughout the place. A small bar fills the far corner and there’s seating upstairs (though we didn’t venture up there). Out front, there’s a good sized patio area, where one can sit to watch tourists and others pass on the square during the warmer months. Though it was busy, we were seated right away and the service was quick and friendly. Our server was happy to share the specials and make recommendations. Drinks and spirits are arranged by country and then maker, along with nice descriptions of many, for those of us from out of town. They offer about 10 taps of Icelandic beer and around 20 in bottles, so there’s plenty to pick from. As it was the first place we enjoyed a beer once we’d landed in Iceland, we asked our server for a recommendation and settled on a nice locally-made stout. Like most bars in Iceland, they have a daily happy hour which offers 1/2 off beer, cocktails, and house wine. Plan to stop in when you can get 2 for the price of one and stretch your drinking dollar even further. The beer list wasn’t huge, but it did contain a decent selection of Icelandic beers. They’ve got a nice range of options, so you’re sure to find something to enjoy. Micro Bar is next door for those looking for the best options, but the list here is just fine for enjoying with a meal or a quick bite. 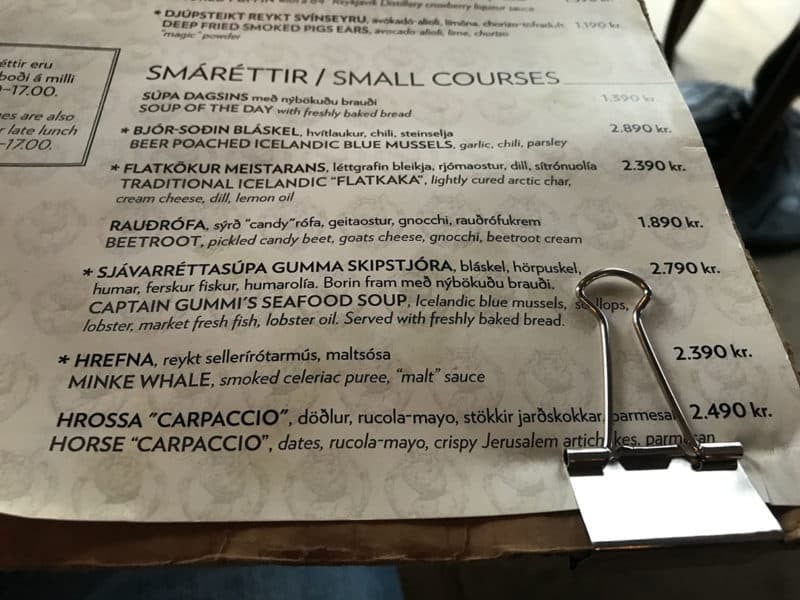 They also offer a number of Icelandic and European spirits, an entire gin menu, cocktails, and a nice wine list. The menu offered plenty of choices, from full meals to lighter appetizers and lunch fare. Prices are on par with what you’ll generally pay in Iceland at any decent restaurant and bar. On our first visit to Sæta Svínið Gastropub, we kept food light by just ordering a basket of bread. My wife fell in love with the fresh, creamy, and sweet date butter with Icelandic sea salt which accompanied it. Fresh, crusty and chewy, the bread was a far bigger hit than we’d planned and there was much consideration with ordering another basket to enjoy with our beers. 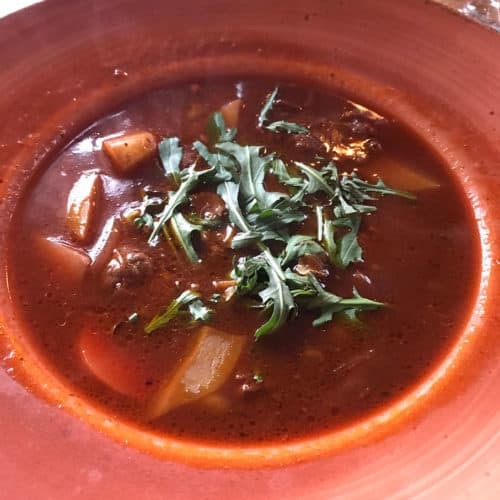 On our second visit, we enjoyed a fantastic bowl of house-made soup of the day (served up with more bread and date butter of course). It was a wonderful way to warm ourselves on a cool winter day in February. Beers helped to wash it all down. Everything we saw being served up to others looks delicious too. From the great menu, fast and friendly service, convenient location, warm feel, and decent beer list, Sæta Svínið Gastropub is a nice stop for a quick bite or full-meal. It’s a great option for food before heading next door to Micro Bar for the best beer list in Iceland.